sfApplicationMapPlugin is an easily configurable documentation-generator tool. It generates a graphical map of your applications using GraphViz software. It is useful when you want to have an overwiev of a specific application or of a whole project - each module/admin-module is marked with all actions and their comments. Take a look at the plugin readme tab to see some examples. You need to have GraphViz installed on your system to use the plugin. New plugin versions supporting symfony 1.2-1.4 has been released. Thanks to bugs reported by Gordon Bazeley, the plugin should work correctly with no dependency on operating system. sfApplicationMapPlugin is listed as a Software Engineering Tool on the official Graphviz website. The main thing to be done is supporting plugins used in projects. Any contribution is welcome, as well as bug reports and questions. Recently I got involved in developing and deploying a small website promoting a book that has just been released. My coordinator asked me to choose one of the most popular Content Management Systems (Wordpress, Joomla, Drupal) to deploy the site on. 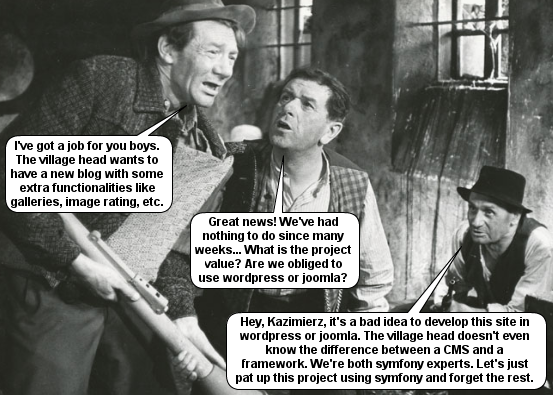 Since I have a very little experience with developing apps based on a full-featured CMS, I was not so happy to be forced to learn a CMS just for a single small project. I got an idea of giving up wordpress (after 20 minutes of reading documentation)... At first, it sounded quite crazy - to develop a small site with such a powerful tool like symfony. I asked myself questions like 'do I really need such an advanced tool to develop such a trivial project?' or 'how long is it going to take me to implement all mechanisms that are already implemented in wordpress (such as nice looking menu, panels, intuitive interface and so on)?' Maybe long... but the more I was analysing the time difference between designing the app in an unknown CMS and very well-known symfony framework, the more the symfony option was attractive. Developing the frontend is only putting the new layout on. Backend is more complex. But still it's all very easy and extremely fast to use. Using sfAdminDashPlugin, sfJqueryReloadedPlugin and sfDoctrineGuardPlugin, the greatest 3 symfony plugins, gave me the basis of a backend engine with many features ready to be improved (e.g. I could define user credentials, I could organise the backend menu, etc). I use these 3 plugins in 99% of my projects (and suppose more people do so) and it takes me very little time to configure those plugins. Developing backend is mainly working with generator.yml/module interface configuration, because this part is usually different in all web apps (meaning that you can copy lots of model/form/filter methods from your previous projects, to save time). If you implement any feature and use it in any project, you can always copy it later to another project (or make yourself a plugin, which is usually a better choice, because the whole community may reuse your work). Just like my AJAX backend activate/deactivate feature (see easy symfony ajax user friendly example) - after I managed to implement the feature (which originally could have taken me up to 3 hours, including studying entire symfony AJAX, ajax routing, sfJqueryReloaded and so on), now it takes me less than 5 minutes to copy it to a new place. Or to make a similar feature somewhere else. And imagine that some mechanisms, like taggable or commentable behavior can be put into plugins, which makes it even faster to use! This is one of the biggest symfony advantages - the speed on development. All of us shall use it as much as we can. Choosing symfony for this project was a great decision. It saved me a lot of time, made me proud of how fast a small symfony project can be developed. Still, the code is comprehensible, it's kept well-documented (so the entire project is opened for any modifications). My experience I want to share with you is that symfony is a good choice also for small projects. Recently, I found an update of the sfTaskLoggerPlugin. As the description says, the plugin allows you to run custom tasks and store the results. In fact, this is a highly customizable tool that provides you monitoring all cron tasks, checking their performance (objects processed, running time) and so on. Installing and configuring this plugin in my company CRM was one of the most challenging and most interesting things I have done since many months. Running each cron consumes server resources and estimating the best time period between the cron finishes his task and before he's run again is not easy. If the period is too small, lots of resources will be consumed with no sense (everything depends on the cron, of course), but if the crons are run too rare, other employees' work is a lot more dificult, because their data s not up to date. 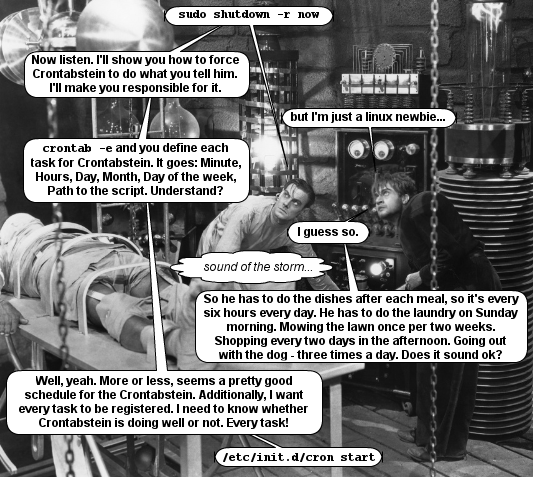 Another important thing is task performance - how fast does it take until the cron finishes his task. When you implement a new task, you measure how long does it take to run the task once. But if your data grows incredibly fast during just few months, will you always remember to check if everything is ok with the application performance? Finally, you need statistics to know what is going on in your system - how often a functionality is used, what is the traffic during specific part of the day or for different days of week, etc. Just one more thing - all this information you would like to know about your own crons should be easily accessible. Until now, I had a basic logfile system which was really far away from meetig my expectations (look above). so, is this plugin useful? Extremely! As almost everything in life, the most useful things are usually the easiest. And it's the same right here. But I must admit, that at first sight the plugin's readme seemed complicated - but it's only the first sight (according to COil, the author of the plugin). In fact, my original task was handled by the plugin after 20 minute. COil replied to my mail within few hours and I got all the answers I needed to install his plugin into my apps. e-mail sending - similar as above. redundant table columns speeding up other functionalities. In my project I have to generate lots of different XML files for external applications such as price comparators or catalogues. We're using the prestashop to deploy shops. Source prestashop database structure can be highly ineffective in our case, so some product data has to be copied between tables once per day (the ineffective queries are executed only once and the result is stored in the redundant columns which are very easily accessible). And the problem is that it has to be run on all products we have in our database. Running a time-consuming query may be dangerous for performance (it's expected that number of products we have is going to be 4-5 times more that it is now). So I need to watch and check if there's need to divide the process into phases (processing parts of data separately) to prevent a breakdown. Another thing to look closely at is accessing external applications' WebAPI. It happens that the WebAPI may be developer-unfriendly :) by providing methods that are really poor. And by the same time, the external application generates great traffic to your company. Well, such integration will be difficult then. Not only you'll have to watch out for lots and lots of traps, problems (and finally - bugs), but also you need to know when to run the cron task and how often. And this is not only about the comfort of other employees' work, but mainly about data consistency, this time. Programming can be art, definitely :). Well, it's pretty easy - each cron run is stored in the database. You know the starting and the ending time of each task (so you know how long does it take to finish the task, how often such task is run, you can check if such task was already run today - and so on). You can define the count of the processed and unprocessed objects (if any error occurs or if just some amount of data has to be processe later - than you define the id of the last processed object). You define the error code, stating if there were any errors during runtime, you're able to check how many crons are running at the moment (or how many of them has broken and was never finished). Finally, you define your own comments for each cron. I use it to generate HTML code that is easily accessible by office workers (in case they need to find if some data was processed and what was the result). It took me some time to publish it, but finally, an example symfony task basing on sfTaskLoggerPlugin is described inside this article. To sum up, it's such a shame that there are so many good plugins that are not popular, including sfTaskLoggerPlugin. It's really difficult to break through and make your tool popular in the community. Well, using cron tasks is not the most important symfony feature - but I'm pretty sure that there are more than just 4 users who can make use of logging cron tasks... Or am I wrong? :) Just give this plugin a try!